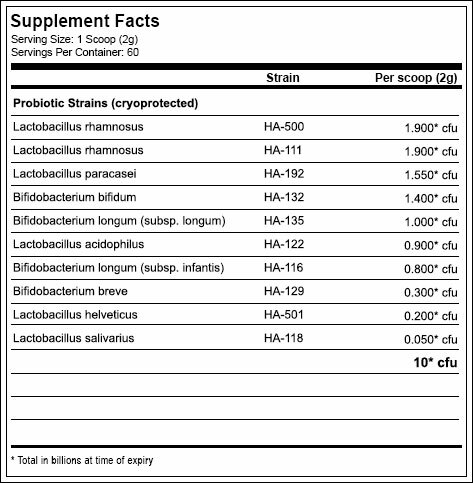 Perfect Probiotic™ for kids contains a strategic combination of 10 kid-friendly probiotic strains, with each small scoop providing 10 billion colony forming units. The powder itself has a pleasant taste and will easily stir into liquids making it simple to administer, even to children as young as 1 year old. It has also been cryoprotected to help ensure the viability of the flora. Children (1-5): Consume 1 scoop (2 grams) once daily, stirred into a small amount of water or liquid of your choice (to form a suspension), ideally with food. Children (6-12 years): Consume 1 scoop (2 grams) twice daily, stirred into a small amount of water or liquid of your choice, ideally with food. Current research has shown that probiotic formulas with more strain variety and higher potencies offer greater activity and overall health benefits. 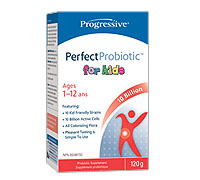 Perfect Probiotic™ for kids contains a strategic combination of 10 kid friendly probiotic strains, with each small scoop providing 10 billion colony-forming units. Perfect Probiotic™ for kids has also been cryoprotected to help ensure the viability of the flora. This cold temperature process removes all the available moisture for optimum stability. It is further enhanced by the addition of Vitamin C to reduce oxidation which preserves and extends the lifespan of the probiotics. FOS (Fructooligosaccharides) has been included to feed and nourish the probiotics on arrival, to ensure robust colonization. The powder itself has a pleasant taste and will easily stir into liquids making it simple to administer, even to children as young as 1 year old.